Promotion is valid from now to 19 February 2019. Tickets are valid on selected date of visit for one-time park entry into Universal Studios Singapore to process Annual Pass membership card. Promotion is valid from 25 January 2019 to 19 February 2019. Upgrade upon presenting one (01) Adult/Child/Senior One-Day ticket at Membership located inside USS on the same date of visit within a single transaction. 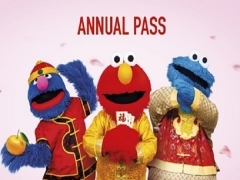 All Annual Pass tickets are only valid for one-time park entry and is required to be processed into a USS Annual Pass on the same date of first admission. Promotion is valid for purchase of up to 6 tickets per transaction per guest. Promotion is not valid in conjunction with other promotions and discounts, including Annual Pass renewal discount for renewing Annual Passholders.